The former Hewlett-Packard executive ran for U.S. Senate in California in 2016. Former technology executive Carly Fiorina, pictured during the Freedom Summit, in Des Moines, is running for the GOP presidential nomination in 2016. Former technology executive Carly Fiorina says she is running for president. The Republican and one-time chief executive at Hewlett-Packard formally launched a 2016 White House bid in a nationally broadcast interview Monday morning. Fiorina, a one-time candidate for U.S. Senate in California, says she believes Americans are ready for an outsider after years of political gridlock in Washington. 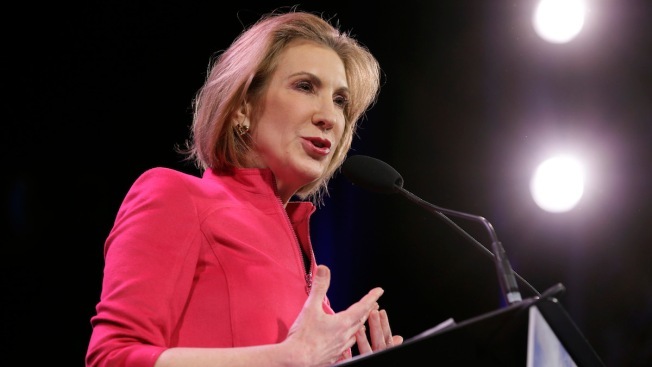 Fiorina appears likely to be the only high-profile woman to seek the GOP nomination. She appeared on ABC's "Good Morning America" and posted an announcement on Twitter and a new campaign website. Her critics are already coming out. Someone created a CarlyFiorina.org website, loaded with unhappy faces, reminding people of the 30,000 people she laid off while she was leading HP, where she was eventually ousted in 2005. In addition, in 2009, the Los Angeles Times broke the story that Fiorina had failed to vote in most elections, for which she later apologized. But Fiorina spent her announcement criticizing others, specifically Hillary Rodham Clinton, the front-runner for the Democratic nomination, saying that she still has much to explain concerning the attack in Benghazi and her personal email and server. In a video announcing her run for the White House, Fiorina took a shot at Clinton, saying the country's "founders never intended us to have a professional political class." "They believed that citizens and leaders needed to step forward. The only way to re-imagine our government is to re-imagine who's leading it," she said. After losing her 2010 bid to unseat U.S. Sen. Barabra Boxer, Fiorina served as vice-chair of the National Republican Senatorial Committee.